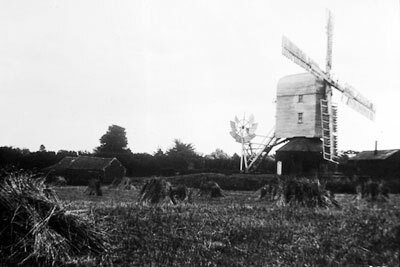 Loddon Mill Road post windmill stood immediately south of the junction of Mill Road and Pye's Mill Road, to the south of the River Chet. The mill was known by many as Pye's Mill, although no records have been found relating to anyone of that name owning or working the mill. A towermill had already been built earlier just to the southwest. The postmill buck was set on a tarred brick roundhouse and was turned to wind via an eight bladed fantail attached to the bottom of the ladder. The mill began life with common sails but in later days the two pairs of French burr stones were powered by four double shuttered sails with 6 bays of 3 shutters and a single bay of 2 shutters at the inner and outer extremities of each sail. 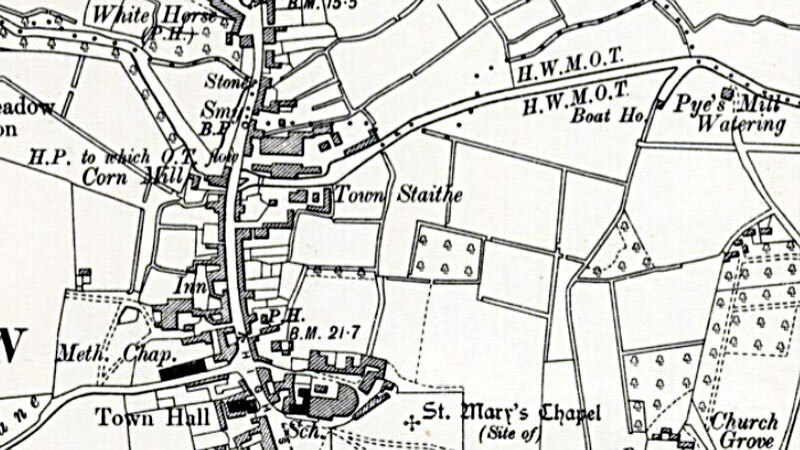 In 1814 the mill was reported as having a joggering skreen. Estate of Mr. Wm Gower late of Loddon, Miller, deceased, accounts to Mrs. Ann Gower, Widow, & Administratrix. Thomas Napp jnr. sold the mill to John Hotson, who was Lord of the Manor. John Hotson was later declared bankrupt. On Tuesday 20 October at the Swan in Loddon, Norfolk, between the hours of 4 & 5 in the afternoon, unless sooner disposed of by private contract. 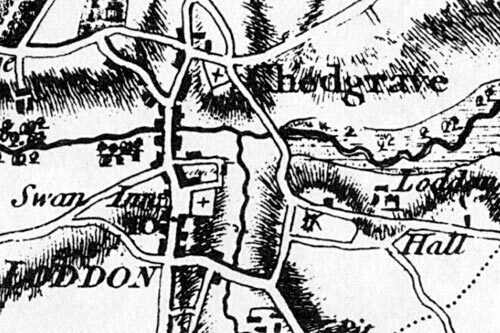 All that PIECE of Freehold LAND containing by estimation thirty perches or thereabouts & an exceeding good POST WINDMILL thereon standing, with the bolting & flour machinery, wheels, going geers & appurtenances to the same belonging, in Loddon aforesaid, now in the occupation of Thomas Napp the younger. Apply to Mr. Timothy Colman of Hardley, near Loddon or to Mr. Wm. Cole, Solr. Loddon. the document continues with who is going to pay the bill etc. The above document includes a covenant that requires Edward Quadling to install two new sails within three months. The above sale document is unusual in that it states the mill is to be sold but the roundhouse on which the mill sits is not included.
. . . Land formerly of the said Elizabeth Rayner late of the said Sir Roger Kerrison and now of the said John Gilbert called the Mill Piece on the South. The above shows that Rev. John Gilbert had either bought the land to the south along with the towermill after the 1808 auction or had used purchaser A. Taylor as an agent. 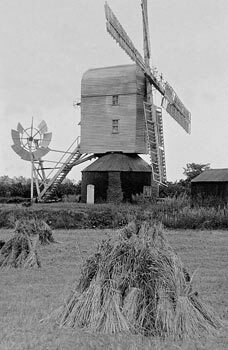 A Substantial & well constructed WINDMILL with two pair of French stones & going gears, now in full trade, now in the occupation of Mr. Hayes of Loddon who is changing his situation. A Capital POST WINDMILL, Round House, two pair of French stones lately put down at a very heavy expence, capital Flour Mill, joggering skreen, beams, scales, weights, bills, bill hooks, implements etc. of Mr. Hayes of Loddon, who is changing his situation. The Land the Mill stands on is Freehold. Outgoings not more than one pound per annum. They are in capital repair & stand well for trade being situated within one mile of water carriage to Yarmouth & Norwich, a good distance from Bungay & Beccles & the principal corn markets in the county. Possession may be had any day next week by the purchaser. Edmund Woolerton of Dent bought the mill property for £630 via a loan from Thomas Bignold. To be Sold by Auction By J. Culley on Wednesday October 9, 1816 at 6 o'c At the sign of the Fox & Hounds in Loddon, Norfolk. All that capital POST WINDMILL with an excellent roundhouse sufficient to contain 4 or 5 score of corn, two pair of capital stones, flour mill & all the going gear. The above Mill is in excellent repair & situated at Loddon aforesaid which is a good corn country and within two miles of the navigable river from Norwich to Yarmouth. Possession may be had at Michaelmas next. Apply to Mr. Robert Wolterton, Loddon or the Auctioneer, Norwich. Interestingly, this time, the roundhouse is included in the sale. 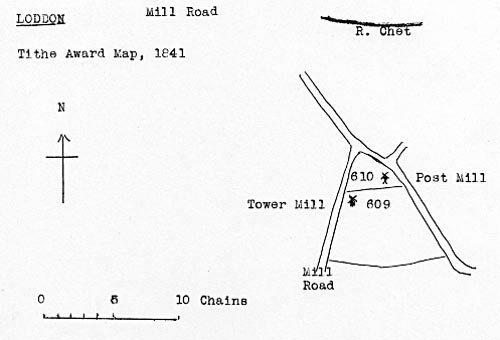 All that small piece of land whereon a Roundhouse and Post windmill now stand containing by estimation 3 roods & 38 perches lying and being in Loddon in the said County f Norfolk which small piece of land is bounded as follows (that is to say) by land formerly of Elizabeth Rayner Widow since of Sir Roger Kerrison Knight and now or late of the Reverend John Gilbert Clerk called the Windmill Piece on the South by the Kings Highway leading from Beccles to Norwich and by Pyes Mill Water on the North and East and by the other land of the said Thomas Napp on the on the East and West …..
William Hubbard directed Ltd and appointed granted bargained sold and demised unto John Steward his executors administrators and assigns all that small piece of land late of Edmund Woolterton and then of William Hubbard containing by estimation 30 perches part of the triangular piece of land formerly of Thomas Napp containing in the whole by estimation three roods 38 perches in Loddon and also all that Roundhouse and post-Windmill then standing upon the said land and all houses edifices and buildings upon the same . . .
William Hubbard, having borred an additional £50, then borrows a further £100. By 1831 John Steward's death required a new Mortgage, this time from C. Corbould. In March 1834 William Hubbard sold the property to William Riches snr., Farmer of Loddon, who then mortgages the property for £500 to Richard Mendham, Cattle Dealer of Loddon. The sale was probably necessary to allow William Hubbard to service his debts to avoid becoming bankrupt. After the sale, William Hubbard and his family moved to Lakenham, where his wife Mary and children, appear in the 1841 Census. However, the same census also records William aged 45, a journeyman miller and his son Henry aged 15, working at Gt_Witchingham watermill. Gt_Witchingham mill was owened by William Riches and as William Hubbard was a journeyman miller, it could be that he was running and managing the mill on William Riches behalf. William and Mary Hubbard had several other children that were baptised in Lenwade. 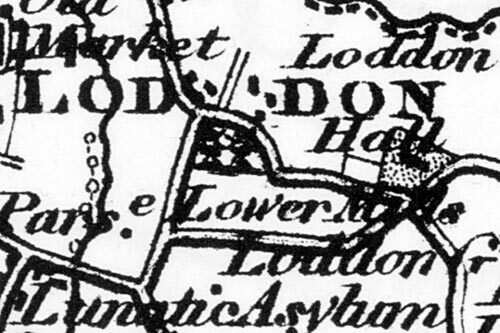 Mary died in 1844 and was buried in Loddon. No further record of William Hubbard appears after that date, although some of their children can be traced through the censuses. Lot 1. The DWELLING HOUSE, WINDMILL, Buildings & LAND containing 1a. 0r. 19p. in the occupation of Mr. George Wigg. Particulars of Messrs. Copeman & Cadge, Solrs. 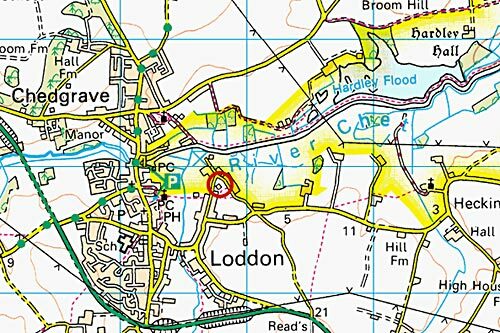 Loddon & of the Auctioneers, Redenhall Grange, Harleston & Beccles. When William & Lucy Blunderfield bought the mill at auction in 1886, they took out a mortgage of £300 with Miss Mary A. Andrews of Norton Subcourse. BLUNDERFIELD Lucy of Loddon Norfolk (wife of William Riches Blunderfield) died 1 August 1900. Probate London 25 August to William Robinson Riches farmer Effects £2083 12s. 6d. Lucy Blunderfield's death almost certainly resulted in William Blunderfield selling the mill. 1901: Miss Andrews sold the mill property to Charles H Galer, market gardener of Heckingham, for £300 via a new mortgage from Thomas S. Elder of Thorpe Hamlet, gent. Census 1891: Frederick Thrower (32) miller at Pye's Mill. Previously he appeared in the Street working as a miller's carter, probably for the Chapmans. 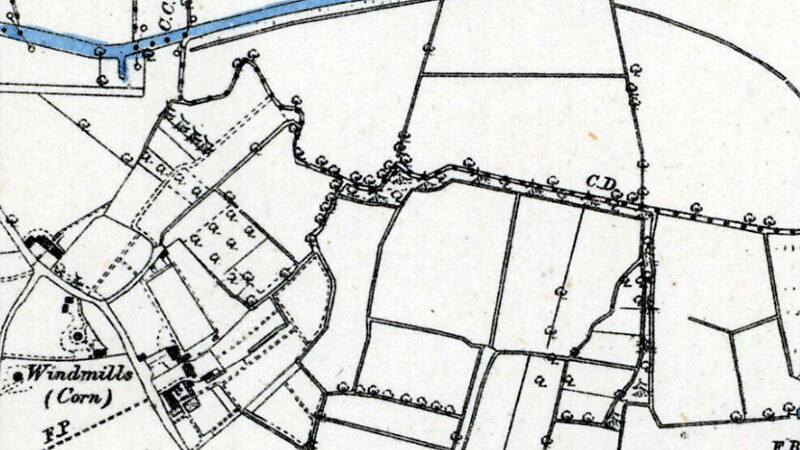 All that piece or parcel of land containing by measure One acre nineteen perches more or less situate in the Parish of Loddon aforesaid with the Messuage stable land outbuildings standing thereon or on some part theref formerly in the occupation of Frederick Thrower and now unoccupied which hereditaments are number 268 on the Ordnance Survey for the said Parish of Loddon (1886 Edition) and contain according to such Survey One acre twenty five perches Except and Reserved to the said Charles Henry Galer and any Purchaser from him the windmill standing on the said piece of land hereby conveyed and the mill stones gears and fittings thereto belonging and also the right at any time before the thirtieth day of June One thousand nine hundred and twenty one to remove the windmill and the millstones gears and fittings and for that purpose to enter thereon with workmen horses and carts for removing and carting away the same the said Charles Henry Galer to make good any damage done to the gates gate posts or premises in the course of such removal but not to be compelled to fill up any holes in the ground caused by the removal of the said mill. 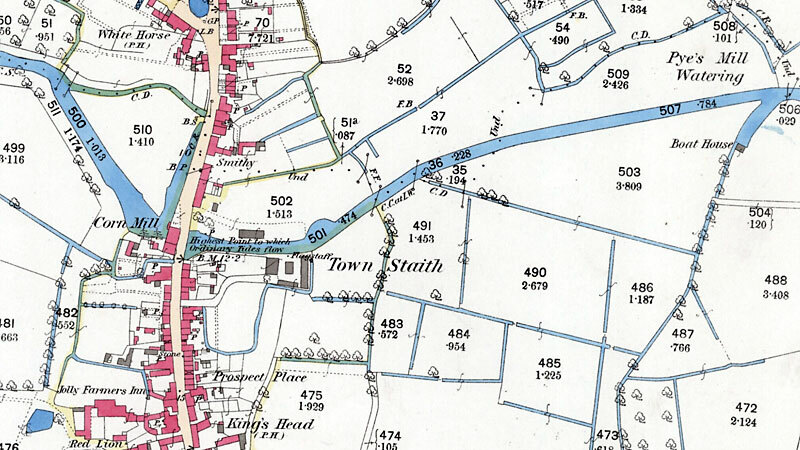 Although the above sale document states that the mill should be removed by 30th June 1921, it would appear this did not happen as the mill is clearly shown on the 6" O.S. map of 1946. One mill (post mill) in meadow to north, other on mound to west of house. Refer to Mr. Goreham, Clerk to Council. Tom Riches of Banham wrote to Philip Unwin on 21st January 1973 to say that a pair of stones were worked on a hurst frame in the roundhouse and the mill was known as Sadd's mill. The ford through the River Chet to the north of the mill is known as Pye's Mill Watering. Some have thought this to be the site of Pye's Mill but I believe that it is merely named after the mill. Doing some research into my family history I am now aware that Mr and Mrs Armsby moved to Pye's Mill House from their cottage in Chedrave probably in 1909. This would fit with the previous occupant of Mill House that you list as being there up to 1908. Leonard Armsby (b. 1842, d. 1923/4) in 1873 married Elizabeth Pitchers (b. 1850, d. ?) who was always called Aunt Minnie. My own great grandfather's wife was the sister of Elizabeth Pitchers. Leonard Armsby was a well sinker, wheelwright and carpenter who was still working when aged 80. Although he worked for himself or with various relatives, he also worked at Langley Hall. Other relatives lived in the Lodge Gates to Langley Hall that are on the main Norwich Road (undergoing restoration 2016). The 1911 Census has the Armsbys living at Mill House with two boys aged 19 and 6. However, the Armsbys, having no children of their own and because of overcrowding in my grandfather's house in Chedgrave, my uncle then a small boy went to live with them, his other siblings all being girls. The Armsby's also looked after another older boy who they had taken in when a baby and who left them in 1913 to emigrate to Australia. My uncle remembered Mr Armsby taking the boys luggage in a two-wheeled hand-barrow to the bus stop in Loddon and later the boy visiting them at Mill House while on leave when serving in the Australian Army during the First World War. The Armsbys moved from Mill House back to Chedgrave in about 1921. 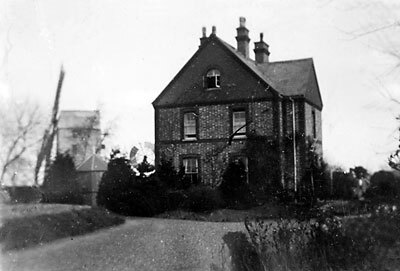 My mother, and sister of the small boy, talked of regular visits to the Armsbys and her brother while they were living at Pye's Mill, and recalled that people residing in the local workhouse would stop at Pye's Mill during their Sunday walk to be given hot water with which to make tea. 24th December 1845: William Riches snr. died leaving the property to son John Riches who was charged with paying £500 to his Executors. That money then to pay legacies to his other children. 1852: John Riches sold the mill to William Riches jnr for £500. Another son Richard Riches was Executor.